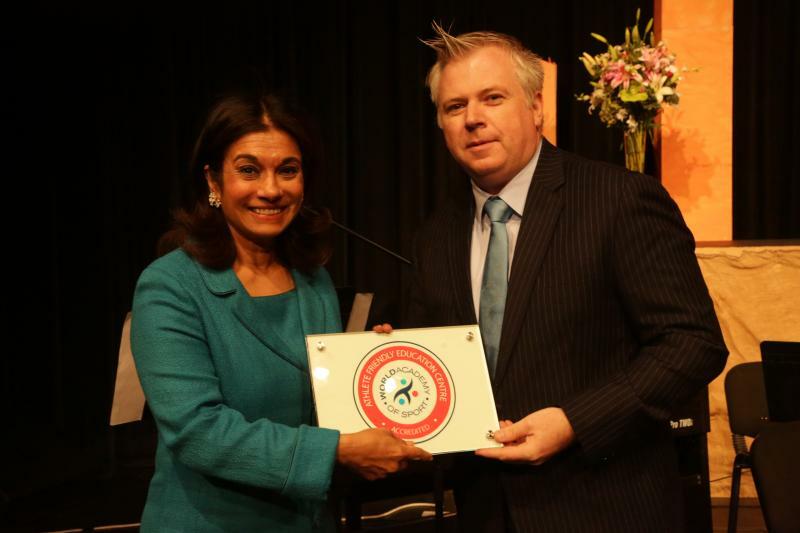 Her Royal Highness Princess Sarvath El Hassan, Chair for the Board of Trustees and founder of the Amman Baccalaureate School in Jordan receives the inaugural World Academy of Sport plaque, accrediting the school as an Athlete Friendly Education Centre. Today saw the official launch of the World Academy of Sport (WAoS) global initiative to accredit schools, universities and other education centres as Athlete Friendly Education Centres (AFEC). The Amman Baccalaureate School (ABS) in Jordan recently completed its accreditation visit by the WAoS and demonstrated its impressive sport programme and the way in which it supports the requirements of its high performing student athletes. The AFEC initiative has been a key feature on the WAoS International Advisory Board (IAB) agenda over the past few years as industry debate has been sought in its development. The accreditation is based on a defined criteria which assesses the Centres ability to understand and service the requirements of high performing student athletes. This institutional approach to assisting student athletes balance their academic, sport and personal lives is increasingly being addressed at universities in various countries around the world, however is unique as a global initiative at the high school level. The AFEC criteria used to assess schools and universities has not only been debated by the WAoS International Advisory Board but also as a basis for advice provided by the International Olympic Committee (IOC) to young athletes and parents when selecting an athlete friendly school. Throughout discussions in the development of the AFEC criteria, inclusion and accessibility for student athletes was considered as an important factor. This is to ensure that as the AFEC network grows current and aspiring competitive athletes, be they national team members, Olympians or Paralympians, will have better access to the highest standard of education that is sensitive to their needs. An important partner and central to the current group of schools also being accredited today is the International Baccalaureate (IB). Over the past several years the WAoS and IB have sought to develop a framework which addresses this important issue facing student athletes. These schools are receiving their AFEC accreditation and as such joining an IB Pilot Project in partnership with WAoS to allow student athletes to complete the IB Diploma Programme in a period of up to 4 years. Schools interested in applying to become an AFEC should contact Lin Zhang at the World Academy of Sport lzhang@worldacademysport.com and further information can be found at www.worldacademysport.com. Press queries should be made to Michael Cary at the World Academy of Sport mcary@worldacademysport.com. The World Academy of Sport is the world’s leading educational partner to International Sporting Federations and their member constituents worldwide. The Academy offers a wide range of educational programmes with a global reach for sport and event participants from athletes and event organizers to administrators and managers.